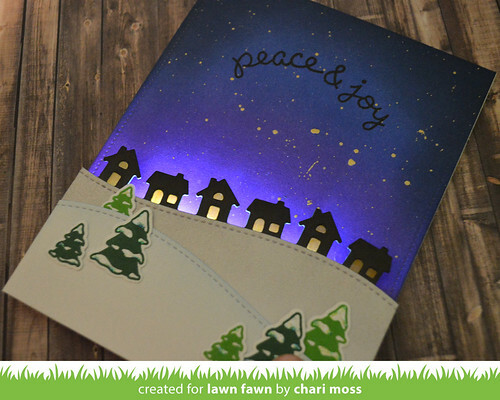 This week the Lawn Fawn design team is playing with Chibitronics and adding some fun light up features to our projects. For my card I kept it simply and let the light be the wow factor. I used wilted violet and blueprint sketch distress ink to create a night sky and splattered it with gold watercolor paint for some beautiful stars. The little town border is cut from Storm Cloud cardstock with the top edge inked with black soot distress ink. I colored some small pieces of vellum with a yellow copic marker and then layered them behind the houses so my light would shine through. 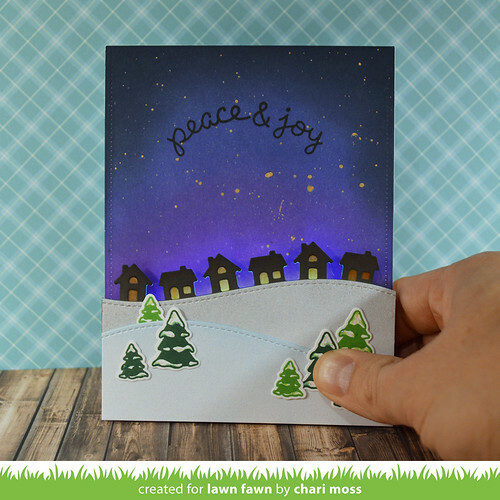 I layered some shimmer white cardstock on the bottom, cut with the stitched hillside border dies. I lightly inked them with distress ink using hickory smoke for the back hill and tumbled glass for the one on the front. 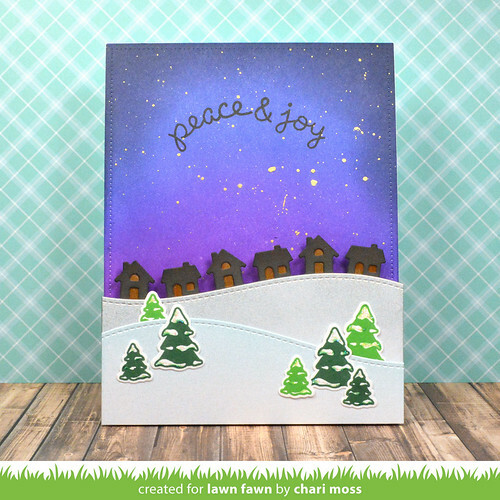 The trees are from the Ready, Set, Snow stamp set and are stamped with Noble Fir and Jalapeño inks. The battery is hidden behind the trees in the lower right corner, a little pressure here will make the three white chibitronics lights hiddedn behind the snowy hills and little town light up casting their glow up into the night sky and lighting up the doors and windows of the town. I really love how that gold paint splatter in the sky sort of glows with Chibitronic lights as well. 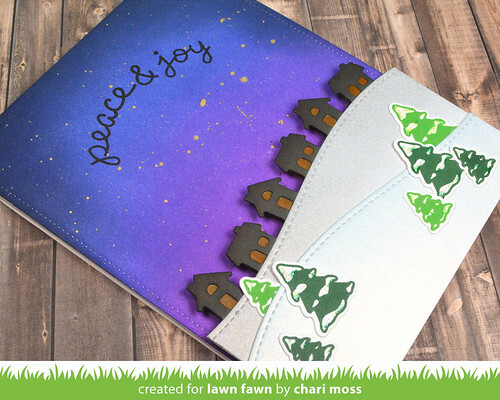 If you have not already, visit the Lawn Fawn Blog for more projects using Chibitronics. Thanks for stopping by today. Such a great card! I love the chibis and you make great use of them! !